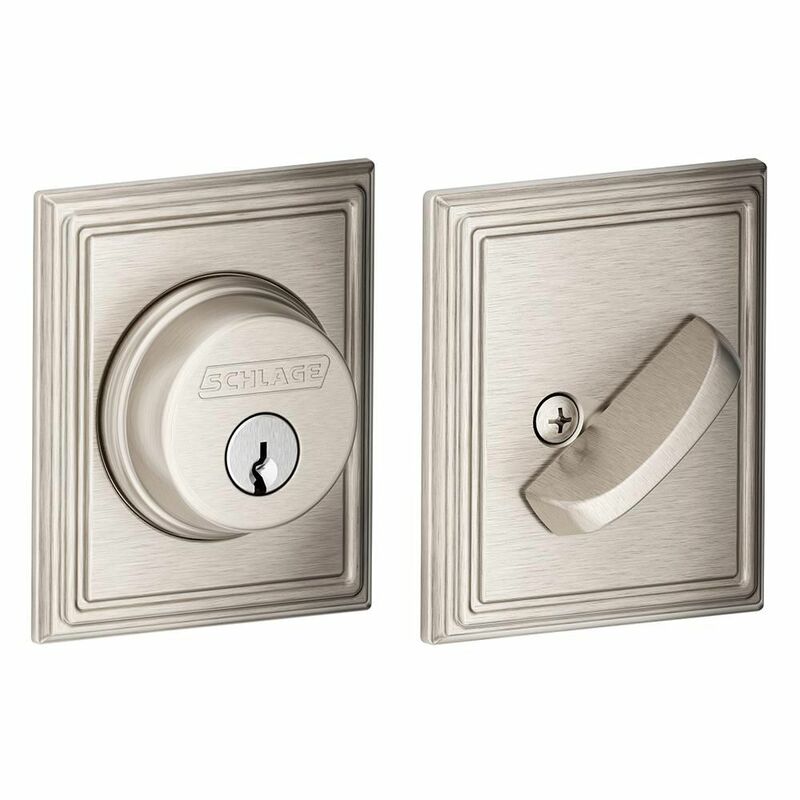 The Schlage Single Cylinder Deadbolt with Addison Trim in Satin Nickel is perfect for use on exterior doors and adds an extra layer of security to your exterior handleset or knob/lever. The Addison Trim's distinguished look incorporates subtle details without losing its classic simplicity. When finished in Satin Nickel, the deadbolt offers a tasteful and flattering accent to any home. Plus, it's been designed and tested with strength and durability in mind. Baldwin has a 60 year legacy of craftsmanship and innovation. Rated #1 in quality by builders and contractors, Baldwin is pleased to offer a line of luxury hardware for the discriminating consumer, our Prestige Series. Feel the difference - Baldwin hardware is solid throughout. With a 60 year legacy of superior style and quality, Baldwin is the choice for an elegant and secure presence The crisp, clean appearance of the Satin nickel finish adds to the overall look of the product and brings a modern feel. This single cylinder deadbolt can be locked or unlocked by a key on the outside, or the turn button on the inside. With this Electronic Plymouth keypad deadbolt in Satin Nickel you don't have to worry anymore about hiding keys under the doormat. No more losing, forgetting, or making extras keys time and time again. Step up to a more secure and flexible solution with Schlage electronic security products. Youre free to add, change, or delete user codes in just seconds and to come and go as you please. Single Cylinder Deadbolt Addison Satin Nickel The Schlage Single Cylinder Deadbolt with Addison Trim in Satin Nickel is perfect for use on exterior doors and adds an extra layer of security to your exterior handleset or knob/lever. The Addison Trim's distinguished look incorporates subtle details without losing its classic simplicity. When finished in Satin Nickel, the deadbolt offers a tasteful and flattering accent to any home. Plus, it's been designed and tested with strength and durability in mind. Single Cylinder Deadbolt Addison Satin Nickel is rated 4.5 out of 5 by 6. Rated 5 out of 5 by HomeDepotCustomer from great lockset. easy to install. great security features.... great lockset. easy to install. great security features. Rated 5 out of 5 by Feick from Fit and finish are excellent. Item arrived quickly.... Fit and finish are excellent. Item arrived quickly. Rated 5 out of 5 by Jeb1234 from Look great. Work great. Easy to install. ... Look great. Work great. Easy to install. Very pleased with them. Rated 4 out of 5 by David from Looks nice, works well.... Looks nice, works well. Rated 3 out of 5 by R055 from Looks nice but has a poor thermal break I have had this installed for less than 2 months. When the temperature drops below -10 C condensation forms on the lock. The lock is installed on a double glazed garden door off the kitchen. There are condensation droplets on the lock even when there is little or no mist formed at the bottom of the window. The screws began showing signs of corrosion within weeks.